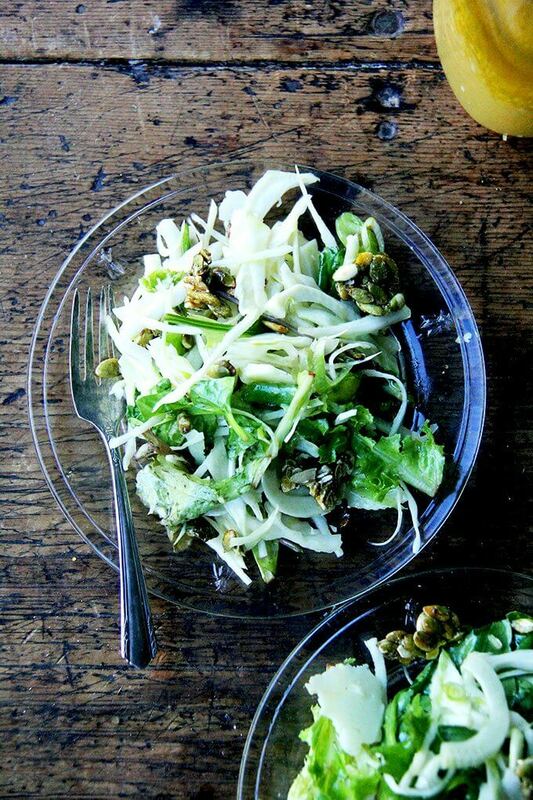 Shortly after making the candied pepitas last week, I threw them into a salad with shaved cabbage, fennel, greens and Manchego. It’s been years since I’ve made the effort to candy a nut or seed to throw into a salad, and I’ve forgotten how delicious and festive they are, this time of year especially. Use the recipe below as guide. Here, I’ve used both vinegar and fresh citrus in my favorite shallot vinaigrette, but you if you don’t have an orange on hand, you can keep it simple. 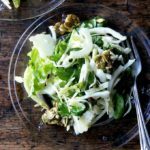 Here, cabbage and fennel are mixed with some tender greens and baby kale, but change the composition to your liking: slivered endive would be delicious as would thinly sliced apple or pear or segments of orange or a sprinkling of pomegranate arils. Shaved Manchego (though blue cheese or parmesan would be nice, too) plus the candied pepitas make the dregs of this salad pretty irresistible. 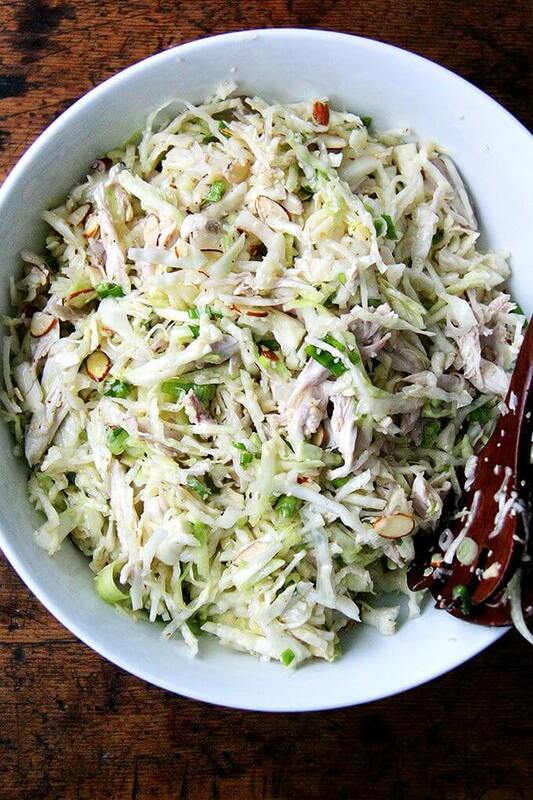 I don’t think a Thanksgiving salad needs to be anything more than greens plus a light dressing, but if you’re up for taking it a step further, this is a good option. 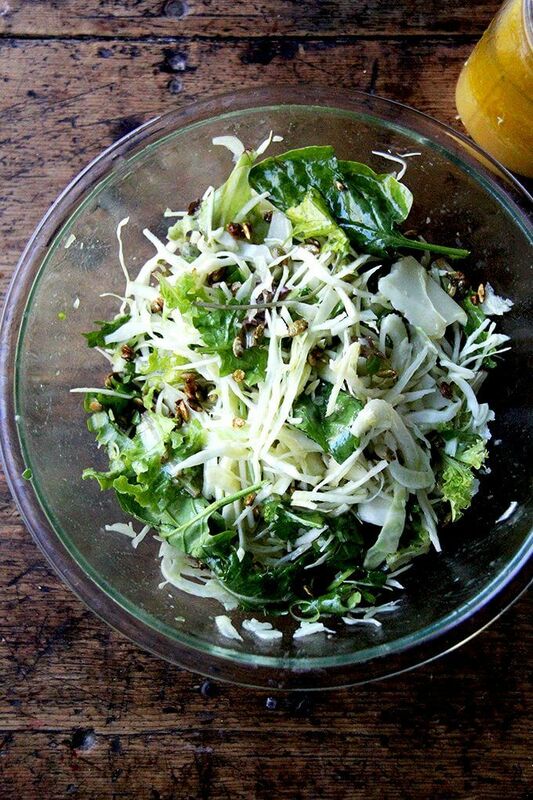 Question: Thanksgiving salad: essential or superfluous? 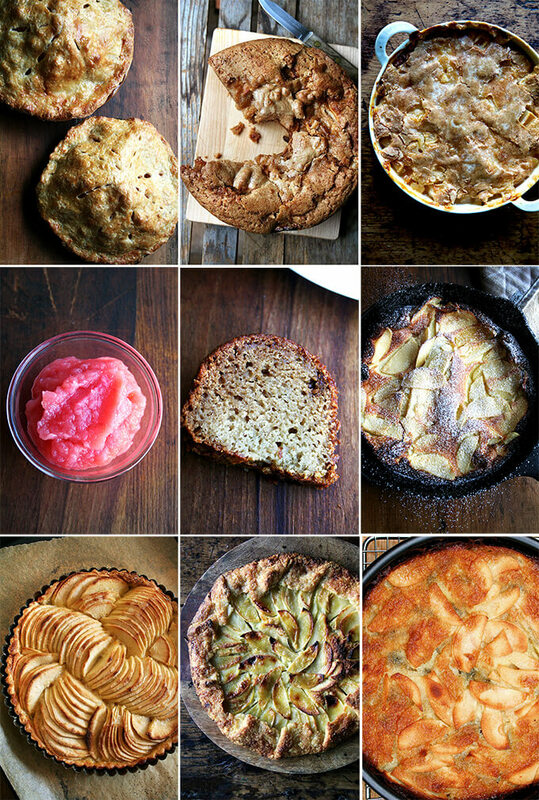 PS: More Thanksgiving ideas here. 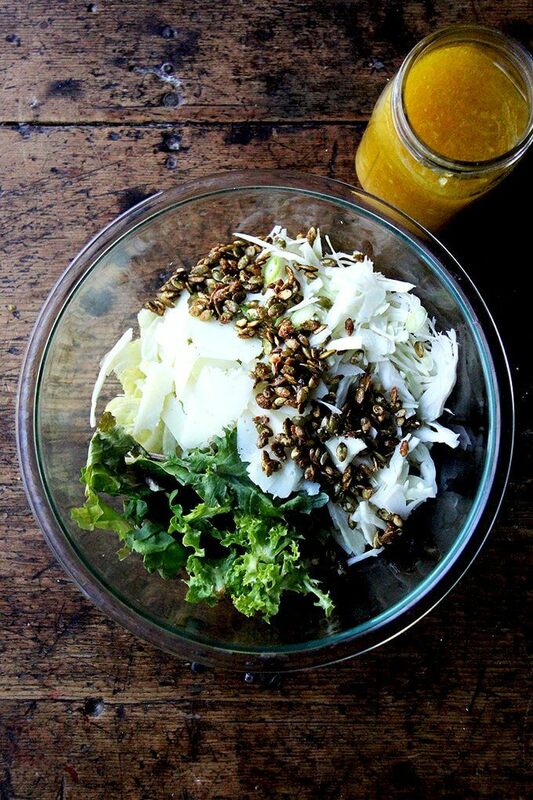 Make the dressing: Place the shallots, vinegar, juice and pinch of salt in a small bowl. Let stand 15 minutes. Whisk in 1/3 cup of the olive oil. Taste. Adjust with more olive oil to taste — there should be nice balance of sweet and sharp in the dressing, and it will be on the thin side. 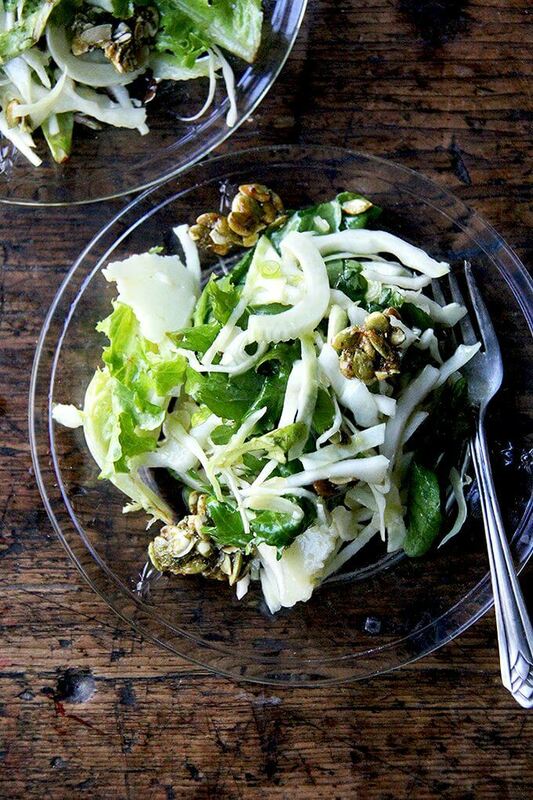 In a large bowl, combine the cabbage, fennel, scallions, greens, candied pepitas, shaved Manchego, and pepper. Pour over some of the dressing. Toss. Taste. Adjust with more dressing or salt or pepper to taste. 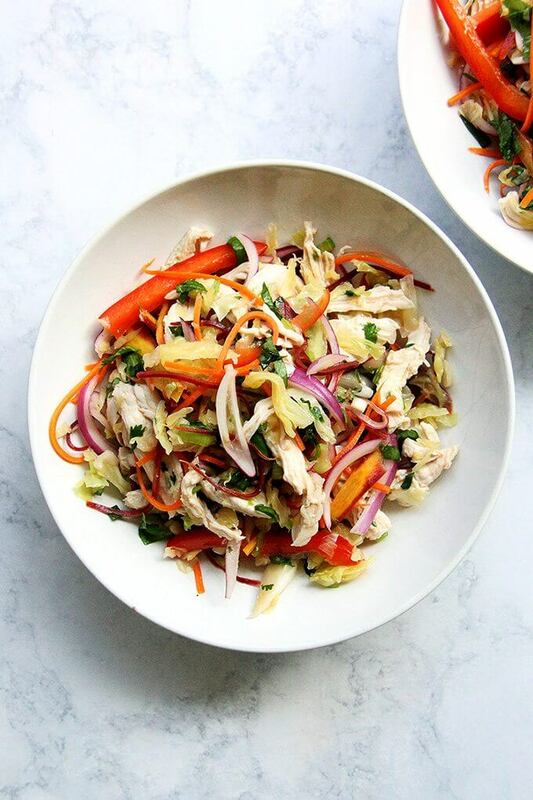 Alexandra, I love this salad, which I’ve been eating and serving all winter in many combinations with a maple dijon dressing. I finally got my hands on white balsamic vinegar and I’m trying the dressing, which friends rave about! How much orange juice do you put in it? Recipe says one orange, but some are juicier than others. Just curious!!! Susanna, I’m so happy to hear this! Thanks so much for writing. And re oranges, I know, so vague. I would say it’s probably about 1/4 cup. It’s a very thin dressing. Sometimes I find the clementines to be juicier than the big oranges, so I’ll use one or two of those, but if I get a juicy orange, I’ll just use that. If you start with a juicy orange, you can start with half then add the second half if you wish. Hope that helps! I love this recipe. It’s refreshing and pretty. Although I don’t usually like candies anything in my food or salads, these complement the cabbage nicely and add additional texture. (The leftover pepitas are also a fun addition for a before dinner accompaniment with drinks.) Really a wonderful combination and delicious in any season but it’s especially appealing in the fall and winter giving a nice contrast to roasted/root vegetables.